In the Educational Complex project (1995–2008)—a multifaceted work that resulted in numerous and varied objects—Mike Kelley sought to recall and represent the architecture of every school he had attended, labeling the parts he couldn't remember as "repressed spaces," in a nod to the theory that we often unwittingly blot out traumatic events. In this early suite of drawings from his notebook, Kelley offers up diagrams, notes, and explicit cartoons, punctuated by informal and occasionally off-color annotations, amounting to a complex, unblushing portrait of the interrelationship between system and subject. 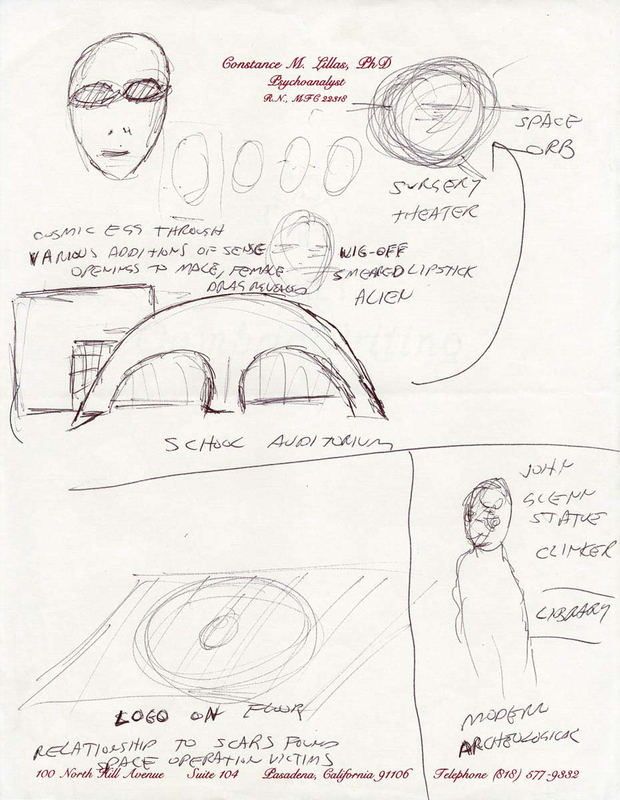 "Notebook Drawings (Related to Educational Complex)." Take It or Leave It: Institution, Image, Ideology Digital Archive. Los Angeles: Hammer Museum, 2017. https://​hammer.ucla.edu/​take-it-or-leave-it/​art/​notebook-drawings-2/​.